Boredom leads to destructive behaviors such as chewing, licking, digging or barking. Play keeps a dog’s body and mind active and builds a healthier, happier, better-behaved pet. 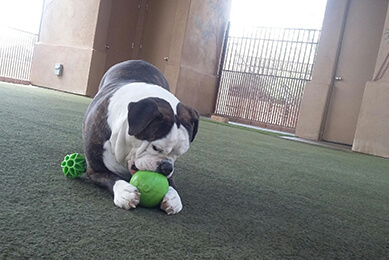 That’s why your dog’s day play care stay at Hassayampa Canine Resort & Spa is always rich with activities and attention. Every day is stimulating, interactive and fun for your pets, and they get to enjoy our clean, healthy, nurturing environment. We also include nap and quiet times for rest and rejuvenation. As dog lovers and parents themselves, our canine specialists are dedicated to ensuring that your dog is well cared for at all times. Please note: As a special amenity, day play care is reserved for our boarding guests. Special consideration may be given to day visitors if space is available.